Gilder Lehrman Collection #: GLC02429.37 Author/Creator: Hemans, Nancy A. (b. 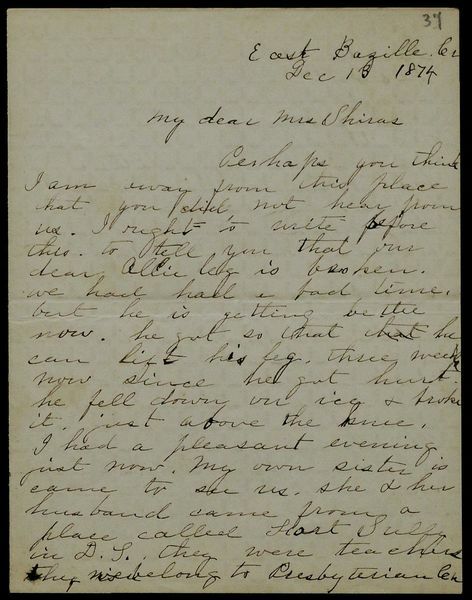 1843) Place Written: Nebraska Type: Autograph letter signed Date: 13 December 1874 Pagination: 2 p. ; 13.6 x 21 cm. Summary of Content: Discusses her son's broken leg and a visit from her sister and brother-in-law, Indian teacher at Fort Sully in the Dakota Territory. Comments on her husband's good health and expresses Christmas thanks to God for living another year. "Our dear Allie leg is brokenâ€¦he can lift his leg, three weeks now since he got hurt. he fell down on ice & broke it, just above the knee." "...My own sister is came to see us, she & her husband came from a place called Fort Sully in D.T., they were teachers they belong to Presbyterian Ch[.] Daniel is in pretty good health this summer. hes got more flesh in his body he never was so before. he use to be very thin. he always in very good appetite."